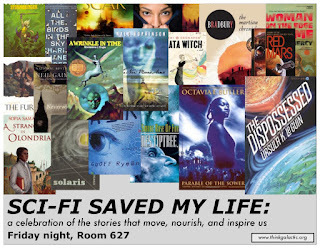 Friday Night, you should really come to Think Galactic's party: "Sci-Fi Saved My Life". We encourage everyone to bring quotes or passages from SF/F works that have inspired you; we're going to have post-it notes to share with. Rescue-or-savior-related costumes are encouraged! There will be drinks! 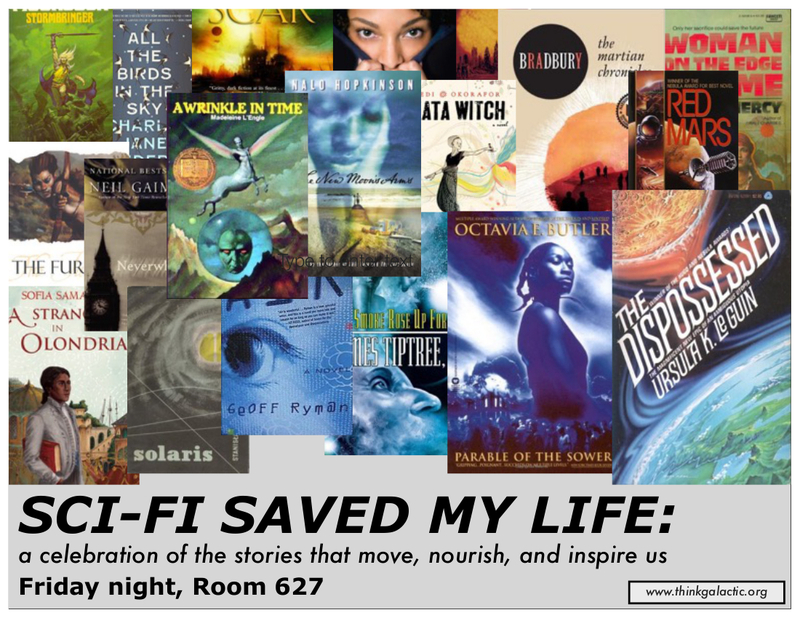 The party gets going at 8:45pm in Room 627. "Expanding the Lexicon of Fantasy: The Works of Sofia Samatar" is Saturday, 2:30pm in Conference 4. I'm very excited to be on this panel, we've got so much to talk about. Highly recommended, Samatar is one of the best and most intriguing writers right now, and all of us on the panel have been talking about a whole slew of diverse topics we want to examine and celebrate. Sunday, I'm on the panel "Why I'm Ashamed to Call Myself an Atheist", which is a bit weird--I'm not ashamed to call myself an atheist, and neither are any of the other folks on the panel. We're spinning the discussion a bit from the original panel description, still looking at issues within various atheist/secular groups and movements (Dawkins' racism/sexism, for instance), but focusing more on positive, intersectional directions and figures. I was more than a bit wary of this panel at first, but after some reassuring back-and-forth with the moderator and other panelists, I'm looking forward to it (especially since lack of secular representation was a concern of mine last year). 4pm in the Caucus. And finally and most excitingly, I'll be presenting my academic paper on Cherryh & Levinas as part of the "Alien Intimacies and Alternative Worlds" panel, Monday at 8:30am in Conference 3. I am incredibly stoked about this; the paper I'm presenting is a part of, really the heart of, the work I've been doing on Cherryh for a little over a decade now. I'm also looking forward to my co-panelists' talks: Kate Fruend-Heuer's "Families as (Re-)Defined by Octavia Butler" and Alexis Lothian's "It's the Future, But It Looks Like the Present: Queer Speculative Imaginaries". Seriously, Wiscon is the best. If you're going this weekend, please say hello if you'd like! I'm Jake Casella, it'll say so on my badge! So much good stuff on the schedule! And really, just a wonderful environment, wonderful folks. Look for site updates and live-tweeting as time & technology allow; Positron will resume normal service next week!